At some point in every relationship you’re going to have to make a cup of tea, or a cuppa if you’re British, for the other person. And depending on how much of a tea fanatic they are, you may be judged by the color of your tea. And if you haven’t been paying attention to how they like their tea, oh boy will you be in trouble. There’s something just a little wrong about dating someone for several months and then realizing that they don’t even know how you take your tea. Luckily there’s a mug out there to help you get out of this mess. Along the inside there are shades of tan/brown going from light to dark. Once you have the mug, all you have to do is have the other person pick the color that they like their tea. Or if you’re more sly, have them make it in the mug once and then see which swatch it matches. I wish I had this when I was in England the first time and incorrectly made the wrong color tea for my flatmate. 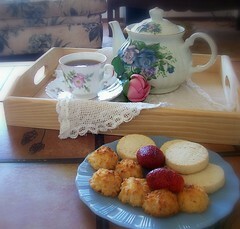 She’s a classic British woman, of course, and like my tea like my chocolate – milky. A simple cuppa tea – saving relationships everywhere. Over the summer, Reese Witherspoon was in Japan as part of her Avon Global Ambassador duties to raise breast cancer awareness. And the lucky girl was treated to a Japanese tea ceremony – and dressed in a traditional kimono. I’m not too sure how traditional it was, because it involved sitting on proper chairs when you’re supposed to kneel – a difficult task for most Westerners when they’re not in a restrictive kimono. So what should a Japanese tea ceremony entail? I’ve been lucky enough to experience one at a tea shop in Vancouver called T that holds a chadō once a month in their small traditional Japanese tea room within the shop. We crawled into the room, knelt on tatami mats (then switched to a more comfortable position when my kneels cried uncle), and Mrs. Saikaino of the local Urasenke Foundation hosted a “thin tea”, where she explained everything that she did during the short ceremony. 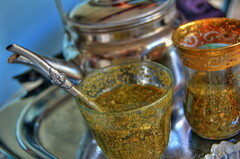 A “thick tea” does not allow for talking and can go on for four hours – that I would love to experience once. There are so many intricate details to the ceremony, but basically it involves making the green tea from a matcha powder, passing around the cup, turning it, and drinking from it. Wikipedia actually has a rather good explanation of the chadō. To find a Japanese tea ceremony where you are, try contacting your local Urasenke Foundation. The one in New York holds regular demonstrations and classes. And the Hakone Gardens in Saratoga, CA is about to host their annual Hakone Daichakai on October 19 – they’ll have several tea sites hosting thin or thick tea. Register by Oct 10. Even though Fall has arrived here in the Northern Hemisphere, there are days when you need a nice iced tea to help pick you up during long days at work. And if you’re in the Southern Hemisphere, well this is just in time for your summer. 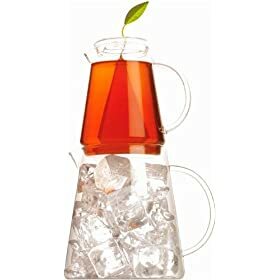 Tea Forte has a nice little brewing/pitcher system for making fresh iced tea when you need it. I haven’t tried it out yet, so I don’t know just how nice of an iced tea it makes. But it does look pretty. I found this cute and zen-like tea towel from a company in Japan. This one should be entitled “R2D2, Mt. Fuji Off Kanagawa” lafter Hokusai’s print. On the site there’s a whole set of 7 Star Wars themed tea towels. I can’t read Japanese so I’ll just make up names for them. There’s also a lightsaber Christmas, C3PO cherry blossoms, Vader and Yoda Christmas, zen stormtroopers, and Dark Side/Light Side dueling heads. Looking for the gift that says it’s always time for tea? These cute clocks might be your cuppa tea. Not sure if it’s the image, but the color looks slightly off to be a real cuppa tea or coffee…but maybe you can switch out the face easily with a piece of card that looks more like the correct color of your tea. This is good news for the environment and tea lovers who what to be eco-friendly in their choice of tea. Traditional Medicinals has offset 100 percent of its electricity usage with wind credits, and this new solar installation will improve upon its environmental objectives, generating 430,000 kilowatt hours per year of clean, renewable energy. It sounds like they take being enviromentally concious to heart. They were one of the firsts in organic and biodynamic agriculture and sustainable wild herb teas. And they help minimize their environmental impact with recycled and recyclable packaging, intensive on site recycling and a fleet of hybrid vehicles. Plus, the company’s 8.5 acre facility is nearly self-sustained with its own water source and purification system, a sophisticated waste water disposal system, a large stocked fish pond for fire suppression and uses dense native drought-resistant landscaping. Perfect for California’s long dry summers. So not only can you take care of your body with Traditional Medicinals’ herbal teas, you can help take care of the environment too. Lesson learned: Avoid carrying your loose tea without it’s original packaging or you might be spending more time at the airport than you’d like.